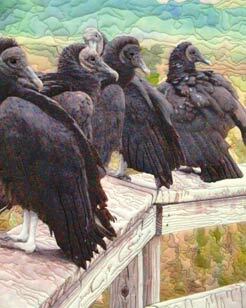 19" w. x 21" h.
Buzzards in the Everglades National Park are among the many birds one can see there up close. 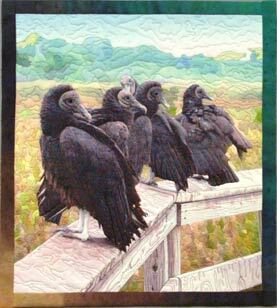 This quilt is a one of a series illustrating famous sayings or phrases and also a series on birds. Disperse dyed polyester, silk border, cotton backing and batting. Machine quilted. Copyright 2002 by Barbara Barrick McKie, all rights reserved.